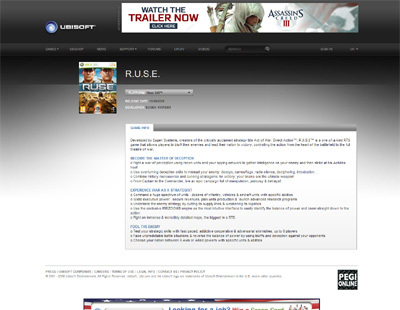 RUSE is a really good military based strategy game for the Xbox 360 which I found to be incredible in every single way and thoroughly enjoyed each and every minute of playing the game. The game sees players using their strategic minds to defeat their enemies in a series of battles that come to life before your eyes due to the jaw dropping graphics the game has. Love this game and cannot recommend it enough. We have also compiled a Review System for this, of which RUSE is Rated as Five Stars, the highest possible score available from the Game Review Team.